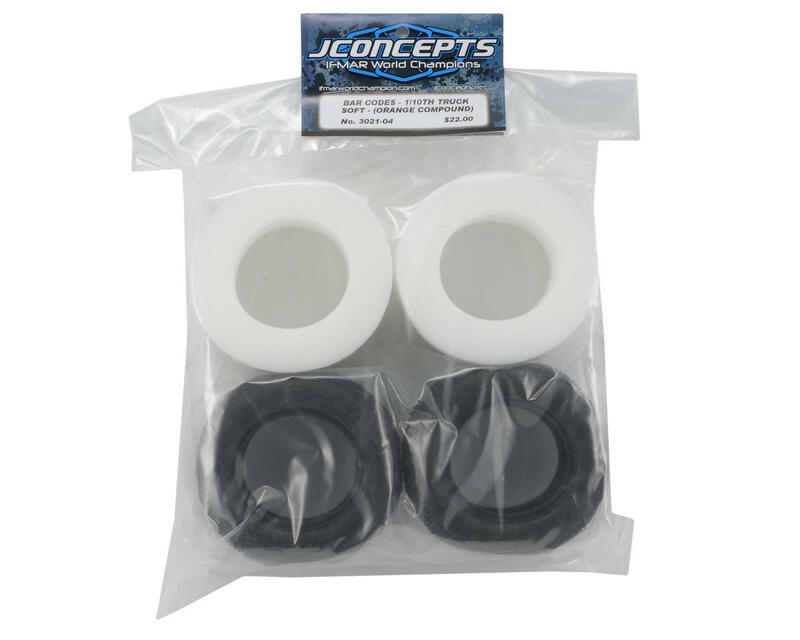 This is a set of two JConcepts Bar Codes 2.2 Truck Tires. The Bar Code design is the freshest tire design seen in the last 10 years of racing development regardless of class and scale. Like the name suggests the alternating bar design combined with the addition of the Y side bars provide uncompromised support for blue and black groove conditions. The Bar Codes are a part of the JConcepts special breed of tire, designed for maximum performance when new or used as the design allows even wear all the way down to the tire body. Bar Codes in new condition excel on hard surfaces that have taken rubber with either dry or wet grooved conditions. Worn Bar Codes excel on indoor or outdoor clay tracks where a minimal dust groove has formed. White (Medium): For High Temperature, Outdoor Racing. Intended for use on abrasive tracks. Blue (Soft): All purpose compound. Excels in dusty, low bite conditions. Gold (Indoor Soft): Developed for indoor Clay surfaces. Green (Super Soft): For conditions with minimum traction. Works well on slippery, wet tracks. Black (Mega Soft): Recommended for conditions 59° and under, or extremely loose conditions. "I prefer to mount them with the big connected Y to the outside for normal blue and black groove conditions. If the track has a lot of rubber on it or is extremely high grip I would look at running them the other direction"
My son races a t4.1 on a indoor clay track we tried everything except the panther switch and liked these best. Also buy the proline closed cells worth every penny. Gonna order some panthers just to try out. I bought these for my clay track. These are the greatest tires ever for a sticky clay cool indoor track with a mild groove. I ran these in my concrete backyard to give them some wear, and after the wear they hook up even better to clay. I reccomend these. AWESOME TIRE! Did time trials this week with about 8 different sets of tires. These on REAR were about 15-20% faster than ANY OTHER COMBO! Used Losi Ribbed (pink) on front. They gripped and pushed the truck forward GREAT in the corner as well as the straits. When using ProLine Caliber (M4) on all 4 corners I got my second best time. I used Losi KBar and Losi King Pin as well. Track is packed clay in groove and VERY loose outside the groove. With my Brushless HPI E Firestorm (2 wheel drive), I could not stay in the groove, but even getting in the loose stuff these tires were lots better. How do I know if you got my review? Did not have anywhere to submit. How wide are these tires? Overall diameter? 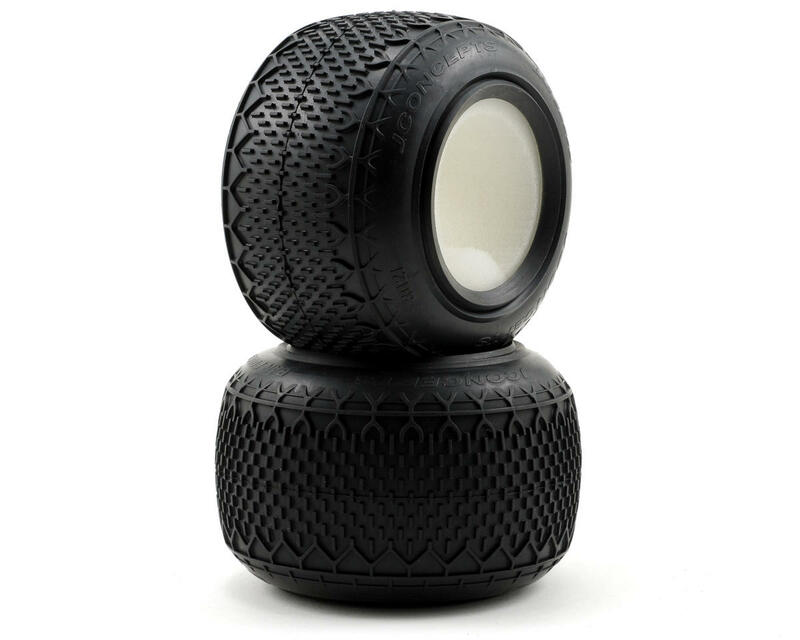 I am looking for a wide low profile Street Tire that will fit on a 2.2 2 in wide 12 mil hex wheel. IM GOING TO TRY THESE WHAT IM HEARING THERE THE BEST ON CLAY!!!!! Great tires, on Clay track the Gold compound works perfect, also like the foam insert, work well over all. Great tires, I run on hard pack, hyper tt with 8.5 Novak, and it's a great setup, I hope they wear good. I have 12 packs on em so far and they seem to be good. Not full packs, I race:-).